Stock markets are often uneasy about mergers – there are problems associated with synergies, and the operational difficulties in combining two different companies. Stocks are known to totter, and even fall, after news of mergers breaks. 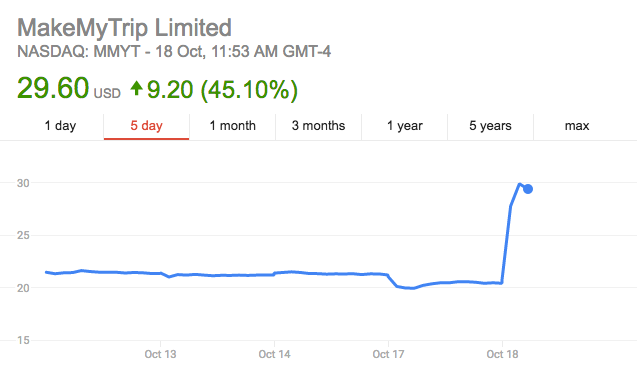 But the news of MakeMyTrip’s merger of the Ibibo broke, its stock zoomed up 43%. The rise in MakeMyTrip’s stock has meant that it is now India’s latest “unicorn” – its valuation in public markets now is $1.2 billion. (Rs. 8,100 crore). The merger involved MakeMyTrip, India’s largest online travel company, buy its rival Ibibo Group’s travel business in India for $720 million in stock. Naspers and Tencent jointly held 91% and 9% stake in Ibibo respectively; they will be issued new shares in MakeMyTrip and will become the single largest shareholder in MakeMyTrip. A Morgan Stanley note has valued the combined entity at $1.8 billion. MakeMyTrip is one of India’s oldest online travel portals, having been founded all the way back in 2000. It was initially meant for US audiences, and was used by NRIs to book their tickets to India. It then shifted its focus towards India, starting its India operations in 2005. In 2010, it was listed on the NASDAQ, becoming one of the few India tech firms to come up with an IPO. And finally, 16 years after its existence, it has achieved a milestone that startups dream of – the company is valued over a 1 billion dollars. It’s hardly a startup now, and after becoming public, isn’t technically a unicorn, but after its latest merger, has cemented its place as one of the enduring success stories of the Indian tech space.